Russian-terrorist troops in Donbas once again carry out the majority of shelling on ATO positions and civilian objects during the evening and nighttime (including with 120 mm mortars, 122- and 152 mm artillery and armored vehicles). In particular, only 25% of all fire strikes during the last 24 hours were carried out in daytime. In addition, also observed were increased insurgent exploratory activities (to detect the combat formations and defense systems of the ATO forces), and of snipers, and enemy sniper groups. In the area of Mar’inka, Pisky, Opytne, Avdiivka, Novhorodske, Leninske, and Shumy, insurgents continue to constantly fire at the positions of ATO forces and civilian objects, using small arms, 82 mm mortars, and AGS-17. Insurgents used 120 mm mortars near Pisky. In the Artemivsk – Holmivskyi direction, militants used 152 mm artillery. Fire strikes were carried out on the forwardmost strongholds and checkpoints in the vicinity of Kurdyumivka. In the area of Hranitne and Staromar’ivka (south of Donetsk) militants used armored vehicles. A militant tank group approached the forward line and carried out adjusted fire from tank weapons at the forward positions of the ATO forces. Afterwards, the enemy’s armored group moved deep inside their combat formations. In the Svitlodarsk direction, several militant mortar units (120 mm mortars) shelled the ATO strongholds in the area of Zolote, Popasna, and Troitske. The fire was conducted from positions near Pervomaiske and Kalynove. In the vicinity of Shchastya and Stanytsia Luhanska, the enemy fired from small arms, 82- and 120 mm mortars, and AGS-17. Tank weapons fired from the direction of Vesela Hora at targets in the vicinity of Shchastya. 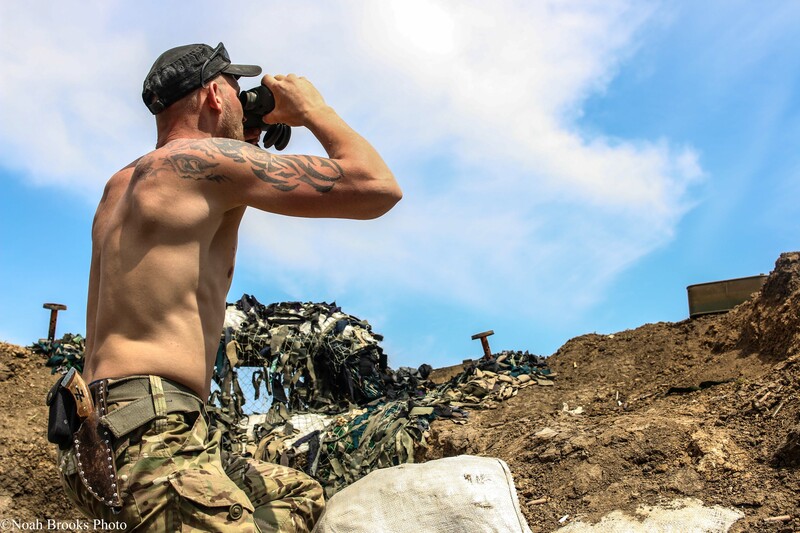 Near Stanytsia Luhanska, several militant infantry groups attempted to get closer to the positions of the ATO forces by covertly moving through the “greenery.” The forward units of the Ukrainian troops opened fire from small arms after identifying the enemy. The enemy retreated under cover of an AGS-17 and fired several rounds at the positions of the ATO forces from an RPG-7. In the area from Novotoshkivske to Krymske, enemy sabotage and reconnaissance groups were observed; they carried out reconnaissance of the ATO forces’ front line. Militant sniper groups were observed practically across the entire demarcation line. The enemy snipers are highly trained. In the area between Starobesheve and Olenivka, the movement of terrorist tanks and AFVs (three tanks were transferred to the vicinity of Novoselivka, six AFVs – for BTRs and two MT-LB were moved to the area of Komunarivka). 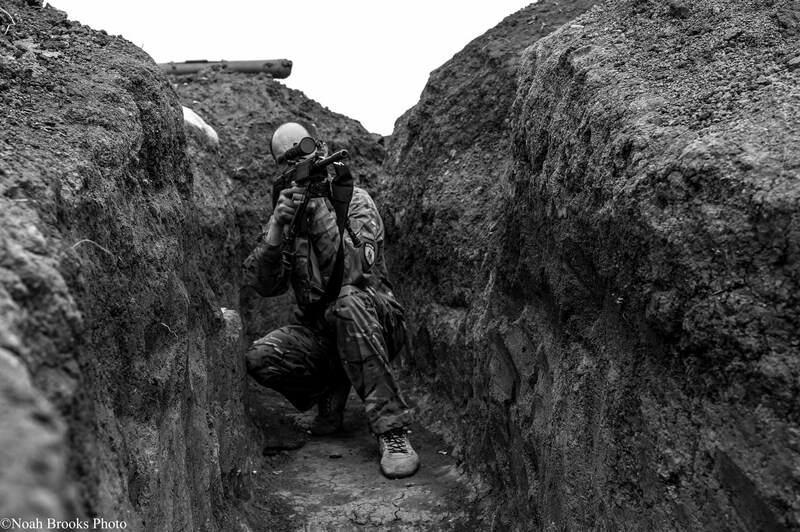 A sniper takes aim in Shyrokyne. Photo: Noah Brooks. In the coastal areas, the deployment of a terrorist tank group (seven tanks) to the first line [of the front] was recorded in an area near Sakhanka. The tanks were moved from the vicinity of Bezimenne. According to the IR group, this information should be of particular importance in the context of the so-called “demilitarization” of Shyrokyne. The arrival of important cargo from Russia is expected in Debaltseve (using Russian Railways as the carrier). Currently, there is no data regarding the contents of the cargo. A heavily armed and well-equipped unit of Russian servicemen (about 90 people) arrived in the vicinity of the railway station in three BTR-80, a BRDM-2, and five army trucks to meet the cargo. The movements of the newest Russian BTR-82A were observed on the territory controlled by the terrorists from “LNR” [Luhansk People’s Republic]. 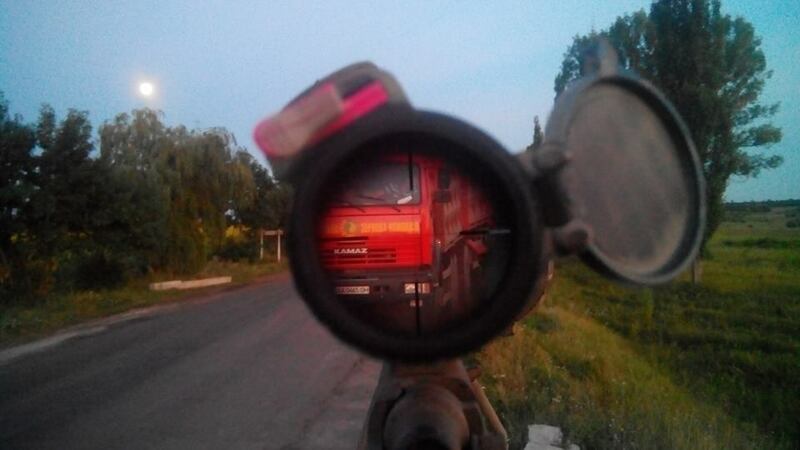 During the last 24 hours, four of these ACVs were recorded during their transfer from Krasnodon to Luhansk, two more ACVs were observed in the area of Stukalova Balka.